Westminster Abbey will today unveil a new stained glass window designed by David Hockney and commissioned to celebrate the reign of Her Majesty The Queen. It depicts a vividly coloured country scene reflecting The Queen‘s deep affection and connection to the countryside. The new window is in the Abbey’s north transept, which was plain glass until now, is called formally The Queen’s Window. David Hockney is one of the most influential artists of The Queen’s reign and his contribution has been recognised with an Order of Merit and as a Companion of Honour, was chosen for the commission. This is his first work in stained glass. The brief to the artist was to provide something symbolic or representational of the subject, rather than a heraldic or figurative design, and for it to be recognisable as his work. Hockney’s response was to design a country scene, set within his beloved Yorkshire featuring hawthorn blossom, using his distinct colour palette of yellow, red, blue, pink, orange and greens. The subject reflects The Queen as a countrywoman and her widespread delight in, and yearning for, the countryside. Stained glass artists and craftspeople at Barley Studio created the window using traditional techniques, working with the artist to translate his vision into glass. Barley Studio is a leading stained glass studio of over forty years based in York. I’m very pleased that David Hockney accepted my invitation to design this window which is a celebration of the reign of Her Majesty The Queen. What he has produced is directly accessible with wonderful colours. It is a country scene to honour a woman who loves her country. The window will be dedicated formally by the Dean in the presence of the artist, his family, friends and invited guests on Tuesday 2nd October at 11:30am. To hear David Hockney explain his vision, please visit the Westminster Abbey’s post on Youtube. Press release from the Westminster Abbey website. 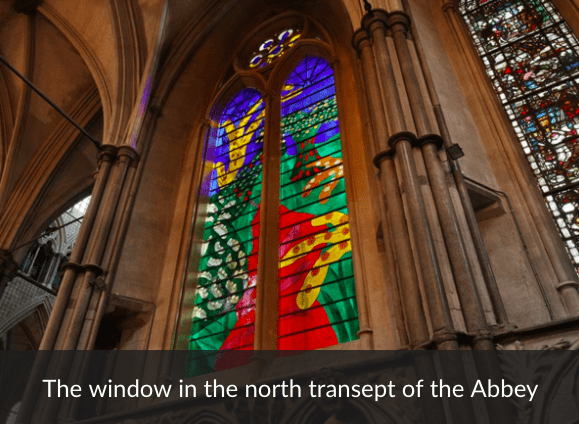 Image : The window created by David Hockney for Westminster Abbey. Screenshot from westminster-abbey.org.